​2 Winds is a paddle sports company based in Zanzibar. We offer guided tours and adventures in beautiful lagoons, mangrove forests and the open ocean by SUP, Kayak and Ngalawa. Come with the wind. ​Go with the water. 2 Winds is named for the two prevailing trade winds that sweep along the coast of East Africa. Kaskazi, Swahili for 'northern wind', blows from the northeast between December and March. While Kusi, Swahili for 'southern wind', blows from the southeast between July and September. These trade winds govern life in the Zanzibar Archipelago. They bring the rains and then blow them away, they dictate the best fishing spots and they act as a way of keeping time, in a place where time seems to stand still. Whilst wind is not always your best friend when you're paddling, it won't stop you from enjoying a paddle all year round. This isn't just a business for us, it's a passion. Our ethos is to be active and under the sun, whilst appreciating and respecting the environment surrounding us. We love the people, culture, and beautiful wonders of the entire Zanzibar Archipelago. Whatever you are interested in we will have something that suits you. 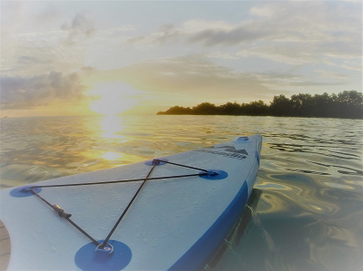 Whether it's exploring the waters within mangrove forests, watching an African sunset on the water, challenging yourself with SUP fitness or relaxing on a board for a social with friends and ice cold drinks. We can do it all. Looking to escape the hectic pace of modern life and unplug from technology? Want an opportunity to find balance, stay fit, and be healthy? Craving an adventure and a chance to connect with like-minded people? Member registrations for the 2 Winds SUP Club are now open, see you on the water!